Very good menthol and fruity mix snuff! The menthol is very mild when comparing to Jaxons 1869 menthol snuff. 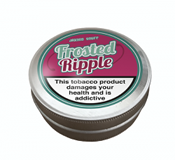 This snuff is menthol right off the bat and ends with a cool raspberry hint. An excellent snuff for any beginner looking for something to start off on. Like any of Jaxons other cans, the powder is light and fluffy and easy to take. Would highly recommend this to anyone looking for a nice easy snuff! Lovely snuff. It's like have a raspberry ripple ice-cream. The menthol makes your eyes water in a good way. You get a nice cool hit with this one and the raspberry lingers for hours after. Couldn't use it all day as it's like having a dessert but totally delicious. Instant hit of just enough menthol followed by an explosion of fresh sweet raspberry fruitiness which lingers on perfectly and fades to soft mellow fruited & toasted flavour with just a slight hint of spice. Perfect mix for those who like a fruity soft tobacco with exactly enough menthol to really bring out the flavour without being too 'medicated'.